The Bible shows prayer as a deeply vital part of Jesus' life. Prayer has surrounded and sometimes instigated the most important decisions of my life. And yet sometimes my practice of prayer feels boring and stale. Over the next week I'm looking forward to two opportunities at church to enliven our prayers with some hands-on activities. This Sunday Access will continue our Holy Ground series of sermons with "The ground of prayer." We'll learn a bit about the Lord's Prayer that Jesus taught his disciples, and we'll also engage with that prayer through some hands-on activities. 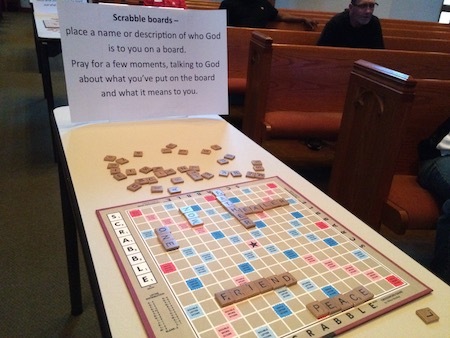 The photo at the top of this post came from a worship service a few years ago that included reflecting on names of God by placing them on a Scrabble board. This Sunday we have some similar but different activities planned that will help us get hands-on with the Lord's Prayer. Then next week on Thursday and Friday, April 6th and 7th, FUMCR will offer a come-and-go prayer experience from 7:00am – 7:00pm called the Lenten Journey. Check out the video below for a quick preview. I look forward to worshipping with you at Access on Sunday!